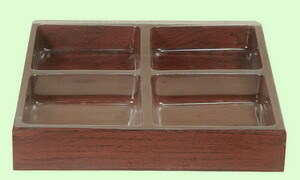 This wood box is finished in dark red. It comes with a plastic liner divided in four sections. It measures 8" long, 8" wide, 1.25" tall. The dimensions are outside measurements. It is available only as shown here.